Do you remember the days of the old school yard? Wide open quadrangles, modest, one or two storey buildings, lawns and ovals where you could kick a football, have a sneaky cigarette or call for a pile on (or was that just us)?Well times have changed. These days, when Australian governments and non-government school commissions plan a new school, they are increasingly looking upwards instead of outwards as the concept of multi-storey or “vertical” schools takes off. The driver for the new trend is the simple fact that urban populations are growing but the supply of urban land for schools is not. Governments and school administrators that are planning schools for metro populations have to go up, just like city businesses and residential developers. It seems that in the future, many people will grow up in a residential tower, be schooled in a vertical school, and work in an office tower all in close proximity. Consequently, there has been a spate of new vertical schools announced in Australia in recent months. The New South Wales Government has already committed to build four "vertical schools" around Sydney while, in Western Australia, the first vertical school has just opened in Perth's CBD. The NSW Department of Education and Communities is planning the state’s first public high-rise school, which will replace two existing schools - Parramatta Public School, which is a primary school, and Arthur Phillip High School – and which will open in 2019. Grimshaw Architects, who designed the school, said the development was part of a growing trend. “At 17 storeys high, and accommodating up to 2,000 students at the high school and 1,000 students at the primary school, the combined APHS/PSP redevelopment responds to the significant urban densification of Sydney and demonstrates NSW’s policy for large schools on smaller consolidated land holdings,” Grimshaw said. "The design is based on the pedagogical model of Schools-within-Schools (SWIS) where each school is comprised of small, more personalised units, or ‘home bases’, with students of all ages and backgrounds. Parramatta Public School (left), and Arthur Phillip High School (right)[/caption]The 17 storey school building will be almost double the height of the state’s first high-rise school – the private St Andrews Cathedral School, an eight-storey brutalist building, in Sydney’s CBD, designed by Noel Bell and Herbert F Hely in 1976. The APHS building will comprise a series of two-storey stacked volumes housing six home bases of up to 330 students each. The building will also feature outdoor learning terraces and semi-outdoor vertical circulation elements, which are designed to encourage interaction between home bases. The design for the adjoining Parramatta Public School is again based on the same model of home bases with up to 280 primary students each. The home bases are all linked horizontally and vertically via stairs, terraces and platforms. 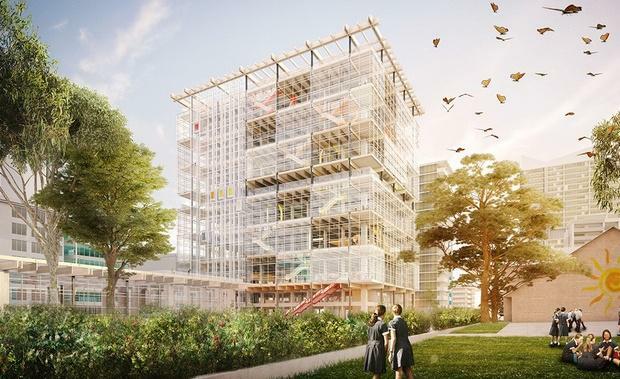 Meanwhile, the state of Victoria plans to build its first vertical school in the Fishermans Bend urban renewal area in Melbourne. The proposed $40 million vertical school will rise to a height of five storeys and house as many as 525 students upon its scheduled opening in 2018. The economic logic of vertical schools seems inescapable. However, they still have critics who worry that they will encourage the sedentary lifestyle that is increasingly harming the adult population. They argue that getting the right amount of physical exercise and exposure to the outdoors is important, especially when growing up and that studying in classrooms in an office block, won’t necessarily give children and teenagers this exposure. Defenders of vertical schools claim that students may actually get more exercise, because they will be forced to walk up and down stairs each hour between lessons, carrying a heavy bag, while students in low-rise schools may not choose to run around at lunch. Regardless of who is right it is clear that vertical schools are winning. They're already popular in cities around the world including New York and Singapore. Recently, the first school went vertical in WA when St Georges Anglican Grammar School moved from a leafy campus at Murdoch University in Perth's southern suburbs to a refurbished five-storey office building on one of the city's busiest streets. St Georges Anglican Grammar School[/caption]With limited space inside the school, the oval is a rooftop, the quadrangle is an indoor cafeteria, the basement is a performing arts space and the classrooms are linked by a fire exit. The Anglican Schools Commission, which runs the school, said it chose an existing office block because land in and around Perth city proved too expensive. If there’s one thing we can be sure of it is that land in Australia’s cities won’t be cheap any time soon.